I live in a small, pretty city called Ourense, in the northwest of the Iberian Peninsula. I’m a dentist. I’ve a marvelous three year old son. My hobbies, apart from aquariums, are running, cycling, walking and cinema. Twelve years ago a friend gave me one of those aquarium kits to set up in my new clinic's waiting room. As I’d no knowledge about the subject I just got some advice from greedy shopkeepers and I introduced a few fishes and plants over an inert gravel soil. Only the toughest fishes survived, and the plants were replaced with plastic ones. One day I saw a wonderful planted tank on the internet, so I decided to investigate how I could recreate something like that. I joined a forum and I learned almost everything I know from there. It was also where I realized that the person who sold me the plants and fishes was an unscrupulous seller. Should I have gone back to the store to say anything? Nowadays I have two aquariums at the clinic: a 250l tank and a 170l. Both are planted tanks (there was a time when I had 8 aquariums). These days I'm excited with the idea of setting up a third tank at home, which I hope to present to some contest next year. I'm a big fan of them. 4. 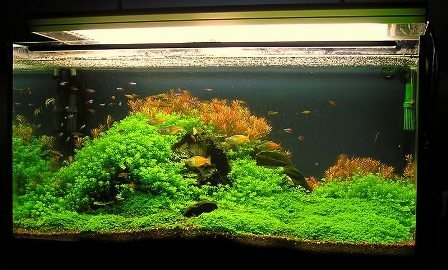 Which kind of soil do you prefer in your planted-aquariums? The soil I got better results with, no doubt, is akadama (a well-known clay soil for bonsais) as an only substrate. I'm going to try an akadama-ADA's Aquasoil Amazonia mixture for my new project. I'll try to take the positive qualities of each one, minimizing the negative ones. Let's see what happens. Despite reading a lot about it, I've never used it. I came to the conclusion that unless in exceptional cases (for example tanks in cool rooms), the use of heat cable is unnecessary. 6. How do you manage water changes and liquid fertilization? Do you prefer industrial or self-made products? I change about 40% of the water in the tank, if time permits it, once a week. I use tapwater, without any conditioning. It’s not something I’d generally recommend as it depends on the concentration of chlorine and chloramines in a city’s water supply. In my case I don’t need to treat the water with anti-chlorine. Again, if I have the time, patience and chemical compounds to hand, I think it’s much more effective and controllable to make up your own products. Usually, I manage to do this. At the moment I’m testing a commercial product that consists of three components that are used daily and, until now, I’m getting good results (using a quarter amount of what the instructions say). Of course it’s the easier option, although more expensive and less controllable. It depends on the water characteristics. With soft water (kh< 3) I recommend just CO2 injection during daylight (I came to this conclusion after observing pH variations with a pH controller). For harder water (which isn’t my case), it seems that the better choice is to run it 24 hours. 8. Do you use the bubble maker (oxygenator) during the night? No. I've never used a bubble maker in my tanks. Filter output moves the water surface, and I consider that enough. 9. Do you often test your water parameters? Which are the most important parameters to monitor? Lately, I don't test any of them although I recommend it when someone is beginning this hobby. It’s important to test parameters, the more often the better, in order to know how the water is, what the plants are consuming, what the soils release, and so on. 10. Which parameters do you usually keep in your tanks (pH, kh, ...)? These were the more common values when I used tests. Today they're expired. 11. In your opinion, does it make sense to recreate the same conditions (including chemical parameters, temperature...) of the original fish's biotope? Do you think aquariums have to be treated as artificial systems or some kind of natural ones? I would propose the opposite situation*: keeping fishes whose ideal water parameters are like our existing aquarium ones. Changing parameters is harder than choosing fish or plants. *unless we have a special interest in keeping a particular species. 12. Have you ever used some ADA products? What do you think about them? 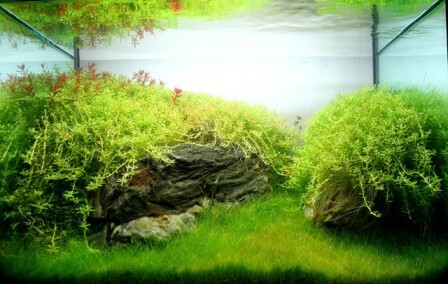 Until now I’ve only tried Aquasoil Amazonia substrate. I’ve decided to use it in my new build, together with Akadama, because I think it works well in starting a new planted aquarium. However, I have to say that it breaks up very quickly and, at first, it releases a lot of nitrogen compounds. I hope to counter both these negatives by using Akadama. With regard to the fertilisers, I haven’t tried them because they seem extremely expensive considering what they contain. The glass instruments don’t convince me either as they need a lot of work to keep them clean and a lot of care in their use, and, once again, they seem very expensive. Regarding the infinity of powders, conditioners and other commercial “inventions” such as bacteria, anti-chlorines and the like… I think this is an area that was already well developed by aquarium enthusiasts but marketing has got people talking about the branded products. I’ve never seen it necessary to use this kind of product in my aquariums. The ADA filters are apparently fragile, and overpriced. The other ADA products seem more “designer” than anything else and are aimed at that market. Why, then, are they so successful? Without doubt the company is good at marketing. For me the most important aspect is their “sponsoring” of the best aquarists who, in showing the products that this company gives them, are carrying out an unbeatable advertising campaign. Another marketing hit was that ADA was the first company to bring out “luxury kits”, with an instruction book included, which were successful in appealing to beginners with plenty of money to spend. 13 & 14. Have you ever used some Seachem products? What do you think about? Have you ever used some Dennerle products? What do you think about? In truth, no. Apart from ADA substrate, I have only used ELOS liquid fertilizer. I have little experience of them until now. 15. 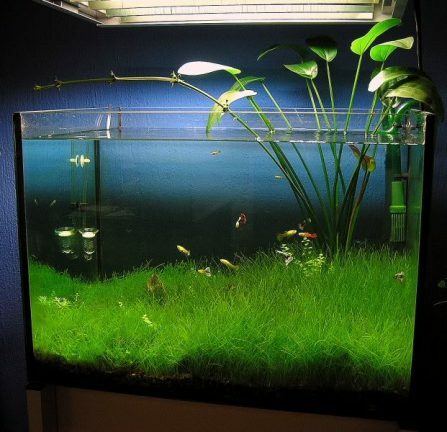 Have you ever tried some other types of layouts instead of planted-aquariums (like malawi biotope, breeding tanks, blackwater biotope, discus or piranhas dedicated tanks, marine tanks, brackwater tanks, paludariums, …)? My passion is plants, so an inner force pushes me towards a planted aquarium for every new setup. 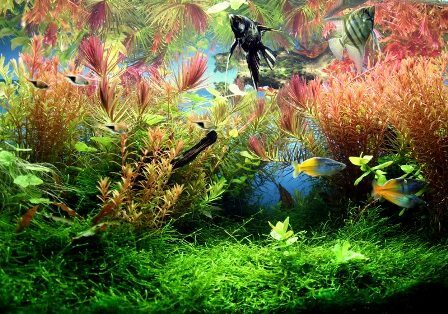 The truth is I've never considered anything other than a planted aquarium (except a small tank I had for breeding crystal red shrimps). 16. What do you think about zen philosophy in aquariums and iwagumi layouts? Don't you think an acquarium should represent a real aquascape? It’s one more style. Personally, I really like Iwagumi style. I'm pretty critical, more than with Zen philosophy, with so-called "Landscapes". I think an aquarium depicting a forest, tree or some mountains is too artificial. It’s the same philosophy that gives aquariums with Roman Pantheons, divers and chests. For me, the most 'realistic' aquariums will be biotopes but, in these cases, tools are of limited use in the composition. In summary, the aquariums that I like are those that mix living and non-living elements, getting inspire the viewer a piece of river, but not necessarily resembling an existing place in the real world. 17. Have you ever taken part in an aquascaping contest? What do you think about them? Yes, I’ve taken part in a few. The most satisfying was a aquascaping contest organised by the Spanish forum DrPez. I won it the second year of the competition and came second in the third year. Personally, I like them. 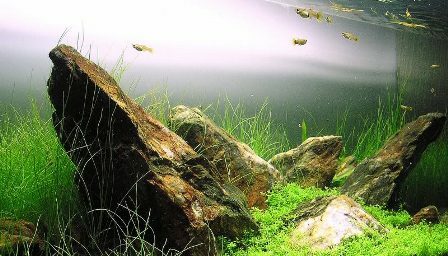 They’re a way to promote aquascaping, as well as an excellent showcase for marvellous aquariums. 18. Do you think they can condition commercial choices of aquascapers? Of course. The contests are the best publicity for certain commercial brands, “sponsoring” a group of good aquascapers (so that their brands appear in the technical details of the aquariums) or directly organising the contests, such as the most popular of all, the IAPLC of Takashi Amano. 19. What do you think about the new IAPLC rules coming on 2012? You want the truth? I still haven’t read them. I have to confess that I’m very disappointed with this contest. This year I’ve received letters from the company ADA threatening to take action against me for re-posting photos of the contest, that were already published on various forums and blogs all over the internet, on my blog. Moreover, I don’t think it’s right that, in theory, we can only see the aquariums in the competition if we buy a book that they publish. The contest is supposed to promote the hobby, not for them to make money (that they already make enough of for the reasons that I’ve commented on earlier). That’s why I haven’t bothered to read the new rules, and I probably won’t publish the gallery of the contest on my blog next year. 20. You are the founder and the owner of one blog (http://www.acuariorosa.com) and one forum (http://www.acuariorosa.org), would you like to tell us something about that? When and how you decided to create them? Which are their main features? I started the blog in March 2009. At that time I was communicating with some forum friends via messenger. Some told me some things, others other things and news travelled mouth to mouth. Then I had the idea of creating a blog to publish these things that were being passed around so that people could be more informed about the “gossip”. The motivation for the blog was that the group of landscapers CAE started to have arguments amongst its members, pages were closed and opened, members expulsed and added, etc... etc... I thought it would be entertaining to recount all this. I have to say, there were big repercussions. Then I found the motivation to interview an aquarist and, from there, I became “addicted” to amateur journalism. Thanks to the blog I have got to know many great aquarists and made good friends. Also, some “enemies”, because of things that I published… but, truthfully, that doesn’t bother me. My conscience is clean. I started the forum almost by chance, through trying things out. Some good friends quickly joined and it’s now the platform that I use most, and that I most value, as it’s there that friends get together daily. Friends who are not only good enthusiasts but excellent people. 21. 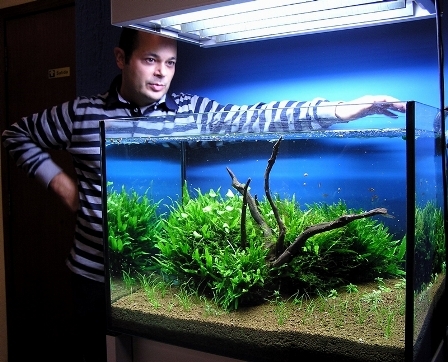 On your blog (http://www.acuariorosa.com) you've posted many interviews related to some of the most famous personalities of acquarium and aquascaping. Have you ever met any of them? Do you want to tell us something about that? Which meeting have you more appreciated? Of the people that I’ve interviewed I’ve met some that post on the forum Acuario Rosa as we had a get-together a few months ago. Truth is, it was a marvellous encounter where we could confirm what I’d already thought on the forum: that they’re entertaining, down to earth, sane and great people. I’d have had occasion to meet some of the people that I’ve interviewed or spoken to on the internet at the exhibitions, workshops, etc... that are frequently organised but, up till now, I haven’t had the opportunity to attend any of these. 22. New ideas for 2012? That we have free and unrestricted access to the gallery of aquariums shown at the IAPLC contest. Or, if not, that enthusiasts protest and don’t participate in it. That commercial fertilisers always list their composition. That sponsored enthusiasts be honest and publish on their blogs and forums that they are being sponsored by brands, so as not to deceive other enthusiasts. That “private” forums disappear. Information should be accessible to all and not just to a few. Well, Oscar, the interview is ended. The Aquaexperience.it staff thanks you for the time you have dedicated to us. Thanks for the opportunity to say some things. Thanks also to Manuel (Fento) and to Brian Boyle, for the time and effort in translating.